Last week we went with a fun poll, asking how to celebrate the coming birth of my first child. The idea was that the kid would be out by now and we could actually be celebrating. But alas, she’s late. We’re being induced on Wednesday, so the celebrations can begin then. Thanks to all the well-wishers. A peer review for the kid’s name was the favorite idea with 47%, which is kind of funny since we’ve opted to keep the name a secret. 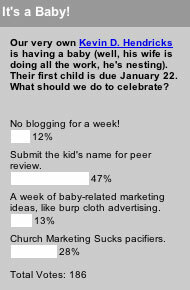 The branded pacifiers were next with 28%, followed by baby-related advertising ideas (13%) and no blogging for a week (12%).